Our rain barrel runneth over…and it’s a good thing! THE SOAK UP THE RAIN NH PROGRAM HAS EXCEEDED OUR 2014 GOAL OF SOAKING UP 50,000 GALLONS OF RUNOFF!! Thanks to the hard work of our partners and staff, we have soaked up nearly 3 times our goal. With 2 months left in the season, we hope to reach our new goal of 200,000 gallons. Check out the Soak Up the Rain website to see how you can help us reach our new goal at www.soaknh.org. Soak Up the Rain New Hampshire is a voluntary program, managed by the New Hampshire Department of Environmental Services, with the goal of protecting and restoring clean water in the state’s lakes, streams, and coastal waters from the negative impacts of stormwater pollution. 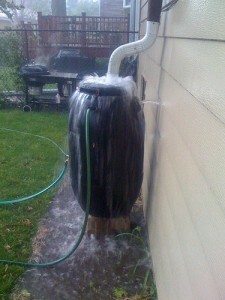 p.s.- if YOUR rain barrel runneth over…go empty it! Wow, that’s awesome! Congrats SOAK!